NutraSea"hp" is a high concentration omega-3 formulation with a specially developed EPA:DHA ratio providing maximum therapeutic benefits . The unique and powerful feature of NutraSea"hp" is its 3:1 EPA to DHA ratio which was developed to provide greater therapeutic action. Although inflammation is necessary in the body's healing process, current research has linked over-expression of the inflammatory pathway to the development and propagation of diseases such as cardiovascular disease, arthritis, depression, immune system disorders, and cancer. Inflammation in the body is a result of the production of "Group 2 eicosonoids" including PGE2, LTB4, IL-1, and TNF. This special class of eicosonoids is produced via the enzymatic oxidation of the omega-6 fatty acid AA. Since omega-6 fatty acids are a necessary substrate for the production of "Group 2 eicosonoids", inflammation is highly dependent on the amount of omega-6 in the body. Contrary to omega-6 fatty acids, omega-3 fatty acids play a vital role in attenuating the inflammatory process. The omega-3 fatty acid EPA can be oxidized into "Group 3 eicosonoids" which possess anti-inflammatory properties. Since eicosonoids are short lived chemicals it is important that the body receive a steady supply of EPA to fight inflammation. EPA and DHA also fight chronic over-expression of the inflammatory pathway through a process called competitive inhibition. Every cellular membrane has limited space available for the deposition of fatty acids. A diet high in omega-6 will result in greater amounts of AA in the cellular membrane and therefore increased production of inflammatory "Group 2 eicosonoids". Increasing the amount of omega-3 fatty acids in the diet results in more omega-3 (EPA & DHA) being deposited in the cellular membrane thereby reducing the amount of omega-6. A reduction in the amount of available AA within the cellular membrane results in decreased production of the inflammatory "Group 2 eicosonoids". The body's neurological system is a complex system of electrical transmissions that rely heavily on an adequate supply of omega-3 fatty acids. Both EPA and DHA play important yet different roles in proper functioning of nerve impulses. Although not entirely understood, it is thought that DHA plays predominantly a structural role while EPA plays more of a functional role. A healthy brain and neurological system rely on a life long supply of DHA in the diet. A deficiency in DHA has been linked to numerous neurological disorders including depression, bipolar, Alzheimer's, schizophrenia, and ADHD. Current research has also shown that adequate DHA levels may not be sufficient to combat neurological diseases and that increased EPA intake may play an important therapeutic role. EPA's benefit in neurological function is believed to be due to its role in cell signaling as well as its ability to suppress the inflammatory compounds PGE2, histamine, and IL-1ß. Research has linked the over-expression of these inflammatory compounds as a pathological factor in altering brain and neurological function. Adults: Take 1 tsp daily. concentrated pharmaceutical quality herring oil, thyme oil, rosemary extract, natural lemon oil, ascorbyl palmitate, natural tocopherols. 1. Is NutraSea pharmaceutical grade? We only use the term “pharmaceutical grade” to convey NutraSea’s superior quality and purity. Consumers must keep in mind that the term “pharmaceutical grade” is not an official classification for fish oil and there are currently no standards that define pharmaceutical grade fish oil (the definition cited in the book “OmegaRx” by Barry Sears is not derived from a regulated source). Some companies use the term “medical grade” fish oil which, like “pharmaceutical grade”, is not an official classification. The most important criterion for quality is that the fish oil surpasses all the standards set forth by the CRN (Council for Responsible Nutrition). These internationally accepted standards are the most stringent in the industry and only the highest quality fish oils meet these standards. NutraSea surpasses all CRN standards for quality and purity. 2. Is NutraSea molecular distilled? The advanced proprietary purification of NutraSea utilizes several purification processes, including molecular distillation, that result in the highest levels of quality and purity available. 3. Is NutraSea third party tested? Yes, each and every batch of NutraSea is tested by at least one independent laboratory to guarantee that it surpasses the industries most stringent standards for quality and purity. With third party testing, consumers can consume NutraSea without ever having to worry about the risk of toxins commonly found in both wild and farmed fish. 4. Is the oil cold pressed? Cold pressing is possible for plant materials such as flax seed or olives but cannot be employed for the processing of fish oils. Some processing and purification stages require the oil to be heated. With NutraSea, these stages are carefully performed under a strict oxygen free environment and are carefully monitored so that the final product is of the highest quality and purity. 5. Does NutraSea come from wild or farmed fish? 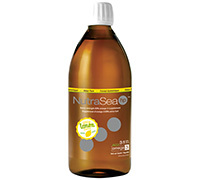 NutraSea is produced from wild fish of the herring family. Wild fish are generally higher in omega-3s and do not contain the levels of environmental contaminants found in farmed fish. 6. NutraSea is from fish – does it taste fishy? 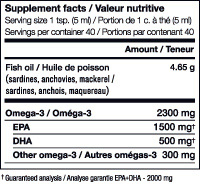 A fishy taste is only characteristic of lesser quality fish oils. NutraSea undergoes processing that removes volatile compounds that can cause unpleasant odors or taste. A fishy odor or taste is also caused by rancidity. Rancidity occurs when the oil starts to oxidize (breakdown). NutraSea contains a proprietary natural antioxidant blend that protects it against oxidation. 7. Why does my oil become cloudy after it’s been in the fridge for a while? The development of cloudy sediment near the bottom of the bottle after refrigeration is completely normal and does not affect quality. All oils have what is called a “melting point”. The melting point simply indicates the temperature at which the oil goes from a liquid to solid state or vice versa. If you’ve ever put olive oil in the fridge you would have noticed how quickly it turned into a cloudy thick liquid. If you return it to room temperature it turns back to a completely clear liquid. This process also occurs with fish oil except that fish oil starts to turn solid at a lower temperature than olive oil. Therefore, depending on the temperature of your fridge you may or may not see a slight cloudiness near the bottom of the bottle. 8. Is NutraSea safe to consume during pregnancy? NutraSea is completely safe to consume during pregnancy, however, you should consult with a healthcare professional before starting any diet, exercise, or supplementation program. NutraSea supplies the omega-3 fatty acids that are vital to the healthy development of the fetus brain and nervous system. Low omega-3 levels in pregnant or nursing women have also been linked to an increase in post partum depression. 9. What is the difference between EPA and DHA? Both EPA and DHA are active forms of the omega-3 family. They have a similar structure but play very different roles in the body. You can think of DHA’s role as more structure/function and EPA’s role as regulatory. DHA is an extremely important component of cellular membranes and is highly concentrated in all nervous system tissue including the brain and eyes. Without DHA the cells do not function properly and can lead to degeneration of the tissue. EPA on the other hand is the precursor to a class of hormone-like chemicals called eicosanoids. Eicosanoids play a vital role in regulating things such as inflammation, blood pressure, blood clotting, immune function, and cell growth just to name a few. 10. NutraSea is a fat – will I gain weight from taking it? No! The good news is that the consumption of omega-3 fish oils can actually lead to weight loss. The omega-3 fatty acids EPA and DHA are not likely to become fat stores because the body will utilize them for more important functions. Even though these omega-3s are not stored as fat, like all fats, they will stimulate the burning of stored fat in the body. Another benefit for dieters is that EPA and DHA can improve insulin sensitivity - an important requirement for appetite and weight control. 11. Is a product with a higher omega-3 concentration better? Higher concentrations of omega-3 (60-90% omega-3s) are not more effective and are usually less stable than fish oil with naturally occurring concentrations (35%). Higher concentration fish oils are usually in the form of ethyl esters as opposed to the natural triglycerides found in NutraSea. Studies have shown that natural triglycerides offer up to 2-3x better absorption than synthetic ethyl esters. 12. I currently get my omega-3s from flax seed – how does this compare to fish oil? Most health experts do not consider flax seed as a beneficial source of omega-3 fatty acids due to the very low conversion rate to the useable omega-3 metabolites EPA & DHA The omega-3s in flax are in a form called ALA. Your body must convert ALA to the active forms of omega-3 EPA & DHA. Numerous studies have demonstrated that this conversion typically results in only 5-10% of ALA being converted to EPA & DHA. This poor conversion is primarily due to human genetics but can be reduced further by poor nutrition and stress. 13. Can I cook with NutraSea? You can mix NutraSea with food but you must remember that NutraSea should never be heated. Heat will damage the oil and make it unhealthy to consume. Heating will also produce a fishy smell and taste. Many consumers have told us that NutraSea is great in salad dressings or can be mixed in a tasty fruit smoothie. Most people, however, prefer to take NutraSea directly from the spoon. 14. Will the small amount of cholesterol in NutraSea affect my blood cholesterol levels? Although NutraSea contains a tiny amount of cholesterol it will have a beneficial effect on blood cholesterol levels. Numerous studies have demonstrated that fish oil consumption plays a beneficial role in lowering blood cholesterol levels and improving cardiovascular health. A healthy diet usually contains between 150-300mg of cholesterol. One serving of NutraSea provides only 15mg of cholesterol. Since the liver manufactures most of the cholesterol in the body, dietary intake below 300mg does not pose a concern to blood cholesterol levels. The major “food enemies” that contribute significantly to elevated blood cholesterol and cardiovascular disease are a high intake of saturated fat, trans fats, refined foods, and sugar. A low fiber diet is also a risk factor for elevated blood cholesterol. 15. If the body needs omega-3, omega-6, and omega-9, shouldn’t I take a supplement that contains all three? Some supplements contain omega-3 and omega-6 fatty acids and some even contain omega-9. Although your body needs all three types you should only supplement with omega-3. The typical diet contains excessive amounts of omega-6 and although some omega-6 is good, excessive amounts promote degenerative disease. Therefore, health experts are advising people to drastically cut back on consumption of omega-6. We do not need to supplement omega-9 either because, unlike omega-3 and omega-6, our body can manufacture its own supply of omega-9. All types of fish naturally contain small amounts of omega-6 but only certain fish contain very high levels of omega-3. NutraSea contains 8x more omega-3 than it does omega-6.